No, I cannot get it unloaded. Please call me. 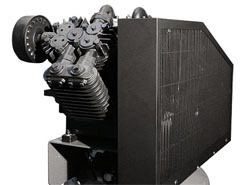 Welcome to the next stage in air compressor evolution: the V-Max Elite series 7580V-603 3-phase air system. Like every member of the V-Max Elite family, the 7580V-603 features the rugged V-Max, four-cylinder pump designed for extreme duty and maximum efficiency under all load conditions. The BendPak 7580V-603 is a 2-stage lubricated reciprocating compressor built with 100% cast-iron pumps to provide the quality and performance required by heavy-use applications like automotive and body repair shops all the way up to industrial manufacturing and fleet service. Every V-Max Elite pump features splash lubrication for total reliability and a V-4 finned cylinder configuration for 360° cooling. Heavy-duty, disc-type valves are dependable and easily accessible without having to perform a cylinder head removal or other overly complex valve maintenance procedures. The large, 100% cast iron V-Max pump puts out an incredible amount of air, but with an even more incredible amount of noise. Thanks to the 7580V's slower RPM speeds and two-stage design, this compressor is much quieter than you'd expect. At the same time, our built‐in intercooler and air‐cooled aftercooler moderates the air temperature, reducing both heat and air moisture. It's always important to evaluate more than just the initial price of the compressor unit. The real cost or savings will be found in the price of maintenance and the electricity required to run it. The more air you can produce per horsepower, the less overall power is needed. Thanks to their massive energy-efficient pumps, V-Max Elite compressors run at notably slower speeds to achieve low operating temperatures and thereby maximizing compressor efficiency. Even a casual glance will quickly reveal that the monstrous V-Max Elite pump outpaces the competition every time in terms of efficiency, reliability and longevity. In other words, nothing comes close to the value of a V-Max Elite air compressor such as the 7580V-603. But what about the moisture and air temperature? BendPak Elite™ and V-MAX Elite™ air compressors directly address this problem with larger pistons operating at lower speeds. Lower rotations per minute directly result in lower operating temperatures, but thanks to the larger piston size, you don't have to sacrifice any performance. With lower a temperature comes much less moisture, ensuring your Elite™ and V-MAX Elite™ has a long and happy existence in your shop or garage. Whatever your high-pressure air needs might be, BendPak has exactly what you need. Duration: From the date of purchase by original Purchaser or 60‐24‐12 months from the date of shipment by BendPak or whichever comes first. b. Items or service normally required to maintain the product, i.e. lubricants, oil, etc. 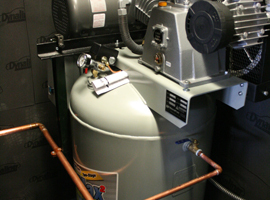 Proven air-cooled design is economical, reliable and environmentally friendly. Corrosion resistant tubing for coolers, separators and valves for longer life and reduced maintenance. Rugged cast iron oil reservoir has convenient sight gauge glass, large oil drain and convenient fill cap.